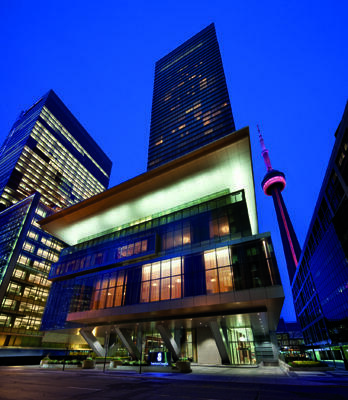 While hotel development slumps in some parts of the globe, one cosmopolitan location is set to add a slew of luxury lodgings in 2012: Canada’s financial capital, Toronto. 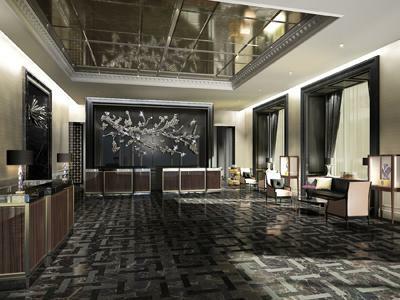 Long a favorite location for film crews and financial institutions, Canada’s largest city has five new luxury hotels by brands such as Four Seasons, Shangri-La and Ritz-Carlton to add to its roster of full-service offerings. What’s behind the recent building boom? 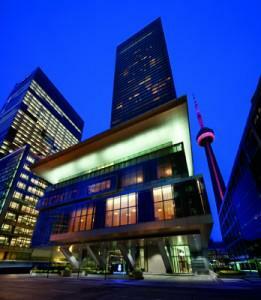 A lack of upscale rooms for a city of Toronto’s size and its importance in the business world. The Shangri-La Toronto. Photo courtesy Shangri-La International Hotel Management Ltd.
“Toronto used to be a cross-border destination—there was more drive traffic, and now visitors are predominantly arriving by air,” says Andrew Weir, vice president of communications for Toronto Tourism. “This gives a sense of demand for sophisticated urban travelers, and it’s important that you have a hotel product that can supply the demand.” Answering that need is the just-opened Trump International Hotel & Tower Toronto, which claims the title of the country’s tallest residential building at 65 stories and with room sizes (of at least 550 square feet) that rival the area of most downtown apartments. The hotel’s 31st-floor, 12,000 square foot Quartz Crystal Spa and its salt-water infinity lap pool offer the city’s most incredible views; a fine-dining restaurant, Stock, is set to open this spring and offer the same million-dollar vistas. Also opening is the new location for Four Seasons Hotel Toronto, which moves from its current location this summer to a freshly constructed 55-story tower in Toronto’s trendy Yorkville neighborhood. With Four Seasons Hotels and Resorts headquartered in the city, the sleek, contemporary structure, with a signature restaurant by star chef Daniel Boulud, is set to be the new flagship for the international brand. Inside the new Toronto hotel by Trump. Photo courtesy Trump International Hotel & Tower. Later this summer, the second Canadian outpost for China-based Shangri-La Hotels opens in another newly constructed downtown tower, bringing the brand’s formal, traditional service and 153 oversized guest rooms and 49 suites to Toronto. A restaurant by celebrity chef David Chang (of New York City’s Momofuku) is rumored to be in the works. These properties join the building boom front-runner, the Four-Star Ritz-Carlton, Toronto, which opened in February 2011 in a newly constructed tower in downtown Toronto. With its 326 oversized rooms and Four-Star spa, the hotel was a favorite for celebs visiting the Toronto International Film Festival in September (George Clooney was spied holding court in the hotel’s Deq lounge). 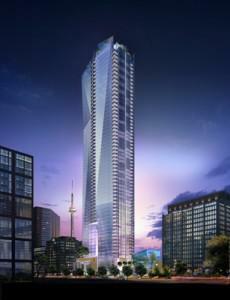 Toronto's new Ritz-Carlton. Photo courtesy The Ritz-Carlton Hotel Company. The one common denominator among all of these hotels—aside from their luxury status—is the inclusion of residences within each building, where owners have full access to the dining, amenities and services of their upscale hotel counterparts, with penthouses in some of the buildings carrying asking prices of up to $30 million. A companion boom in new tourist attractions in the city adds another reason for investors to snap up real estate in Toronto’s downtown. “There is a significant investment in cultural development in Toronto,” says Weir. “We have a new opera house, a new aquarium coming next summer, and the TIFF [Toronto International Film Festival] has a new permanent home, dedicated entirely to film. All these things speak to the changing demand in our tourists, and we’re seeing a development cycle now speaking to that demand.” Choose From More Than 400 House Designs and House Plans We offer house designs in a wide range of styles and sizes. Some of our more popular house designs include European-inspired Georgian and Palladian homes, English Manor house plans, Tuscan-style Italian villas, French chateaux, and Colonial house plans. Our Tuscan-style villas range from 1800 sf to 13,600 sf. Our Newport Classics house designs are gentrified New England-style cottages that range from 1500 to 5000 square feet. Our starter castles, mansions and estate homes are designed in the grand tradition of some of the most impressive homes in the world. Please feel free to search our house designs or browse our photo gallery to get a sense of the many styles and types of house designs we offer.